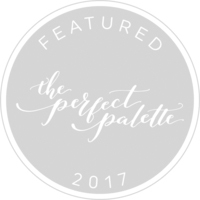 I'm thrilled that the French Garden got featured on the exclusive The Perfect Palette and I couldn't wait to share more images of this suite! The concept was lots of floral in a French setting. I'm thinking of romanticism, lots of details, pretty much like the Versailles during the King Louis XIV era. Hence, I chose to paint rose florals in various pink and blush hues as the primary elements and utilized throughout the paper goods from the envelope liner to the individually painted place cards. For this suite, I chose to use Italian Hand for the calligraphy script. Earlier this year I travelled to San Francisco for a workshop to learn this romantic script. Italian Hand flourished during the 18th century but became a lost art. Hence, I thought the script would be appropriate, given how the romanticism period also flourished and vanished.